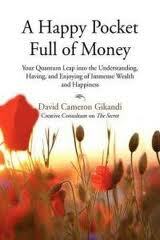 The book is called, A Happy Pocket Full Of Money and it's written by David Cameron Gikandi. The actual subtitle of the book is: "Your Quantum Leap Into The Understanding, Having And Enjoying Of Immense Wealth And Happiness." It explains the very real relationship between science and spirituality in the most uncomplicated way. It's the kind of inspirational book about why we are here that you always wish existed but thought it never did. The subtitle is more than just a figure of speech this book shows how recent discoveries in theoretical physics are actually relevant in the creation of personal wealth. Using a step-by-step approach and explained in straightforward language, A Happy Pocket Full of Money discusses these fascinating insights and lets readers see how their act of observation can actually affect that which is being observed a profound view with much bearing on those who want to create wealth. Here's a list of the subjects covered in "A Happy Pocket Full of Money:"
If you want to be on the path towards financial independence and prosperity, then take the first step and have A Happy Pocket Full of Money PDF.